An English aristocrat (Nicole Kidman) travels down to her husband’s declining cattle station in northern Australia only to find him dead, murdered. When she discovers that his manager (David Wenham) has been stealing their cattle for a rival company, she fires him and sets about restoring Faraway Downs herself. Along the way she enlists the help of locals like Drover (Hugh Jackman), eventually falling in love with them and the country. Australia runs for a length of 165 minutes, making it the longest flick I’ve watched since last month’s Braveheart (1995). I found it difficult to follow at first (partly because of their accents), but things soon got underway. It’s basically a two-part movie in one. The first half is a typical romantic adventure: the hero and heroine fall for each other, overcome challenges, defeat the bad guy, and live happily ever after—a family movie if I’ve ever seen one. But it’s not all bad. Alternating landscapes of lush, active wildlife and rugged rock formations pepper this part, providing a fitting backdrop for scenes worthy of an adrenaline rush. The second half is a lot better, more mature. It makes pointed commentaries about war, religion, and racism—filtered through the main characters’ story, of course, but still a welcome reprieve from the first part’s sappy romance. Essentially an epic drama-adventure story with a happy ending, Australia is far cry from Baz Luhrmann’s earlier success Moulin Rouge! (2001). Clear divisions of good and evil run throughout the film, and the characters are so familiarly one-dimensional they all feel like they can be summarized in a single word. Plus I didn’t like the movie’s portrayal of the locals: the aborigines felt too exoticized, their plight over-sentimentalized (except for the part about them having the right to lead their own lives and preserve their own stories, which I think was just right). It’s not so bad for one sitting—albeit a three-hour one—but it’s not something I would watch again. This entry was posted in Adventure, Drama, Film, War and tagged Australia, Baz Luhrmann, Hugh Jackman, Nicole Kidman on December 31, 2010 by Michelle. Black Swan is a visual riot. It does not fail to beguile with its marvelous camerawork and transitions, unfolding to the tune of hair-raising music. It has the entire movie industry abuzz, and for good reason. Rife with tension (sexual and otherwise), it kept me on my toes throughout its duration. Director Darren Aronofsky drew me so much into the plot that my head hurt after watching. The movie captivated me with every twist and turn. It’s a breathtaking experience, being swept away by a film and spinning along with it, and it is not something we come across very often: an achievement only heightened by its rarity. 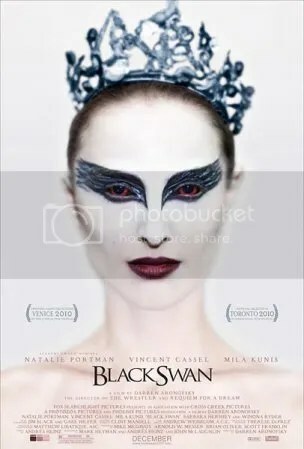 The film opens with a young dancer (Natalie Portman) vying for the lead in her ballet company’s production of Swan Lake. The director (Vincent Cassel) finds her perfect for the White Swan’s part, but doubts her ability to handle the more crucial role of Black Swan, who seems better suited for the newcomer (Mila Kunis). Unwilling to relinquish the starring role, the aspiring prima ballerina pirouettes her way into a perfect embodiment of the Black Swan, at the same time spiraling further and further into madness. Critics have heaped praise upon praise on Natalie Portman’s acting in this film, and I cannot help but follow suit. She provides her character with such authenticity that we are compelled to sympathize, even with such a twisted persona. It especially thrilled me to watch her perform as Swan Queen. And this is also why I feel unsatisfied with the Black Swan’s part at the end. I found it too short. I wanted more. The film’s anticipation of it since the beginning promised me as much. I had hoped to be completely captivated, seduced by the Black Swan, and was instead disappointed by her short appearance, for despite the film’s title the White Swan takes center stage, at least during the ballet. Black Swan is not perfect, but it’s presented in such a way that made me accept it wholeheartedly, minor discontents and all. The obvious love that went into its creation shows through, just like in Aronofsky’s earlier work Requiem for a Dream (2000). Neither film made me feel happy (quite the reverse, actually), but instead gave me a sense of fulfillment that surpasses happiness. I felt disturbed and satiated; both movies haunted me for several hours afterward: I could not have been more delighted. This entry was posted in Film, Thriller and tagged Black Swan, Darren Aronofsky, Mila Kunis, Natalie Portman, Vincent Cassel on December 30, 2010 by Michelle. Written and directed by Makoto Shinkai, 5 Centimeters per Second follows a young man’s search for romantic fulfillment. The movie is told in three segments and runs for roughly an hour. It portrays the interrelated lives of Takaki Tōno, Akari Shinohara, and Kanae Sumida—three adolescents struggling with the unmistakable hold of first love. It is about the innocence and sadness of everyday life, in which we all long for something far beyond us and hope to find it somewhere in the distance. This movie has been praised for the beauty of its screen effects. The setting is lovingly drawn out and utilized from start to finish (despite a few Engrish moments here and there like “Starberks Coffee,” “Windows Vasta”), and images are rendered all the more beautiful by their reflection of the characters’ interior landscapes. Throughout it we see charming pictures of our characters’ ordinary lives, and this I think is the ultimate charm of the movie: its success in bringing out the poignant in the mundane. Cherry blossoms, snow, train stations, letters: this is what life is all about; this is the stuff that makes up love. And in the end these are the things that will sustain us, through time, through distance; and without them love—and life—is not even possible. From before and after that kiss, it seemed as though everything in the world had changed. It was as if I understood everything that had happened in my life these last thirteen years, and the time which was to come. I became unbearably sad. It was scary, and each day was filled with anguish. But feeling happy every time I met him was something about myself that I couldn’t do anything about. By just living one’s life, sadness accumulates here and there. Then here are the English lyrics to the ending theme song, copied in full because it’s the photo montage in this part that actually got me teary-eyed. 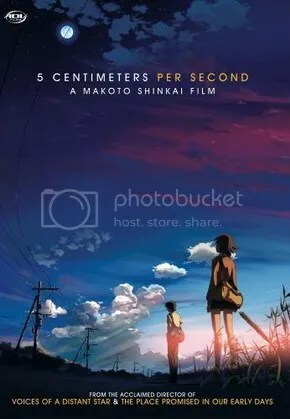 This entry was posted in Animated, Drama, Film and tagged 5 Centimeters Per Second, 5 cm per Second, Makoto Shinkai on December 28, 2010 by Michelle. Some things are better the second time around. I first read this the year I turned eighteen: the book was a birthday present from Gica. I have absolutely no recollection of that initial reading, except that I did not understand anything. The book left no impression on me. Now, at the brink of twenty-one, and almost graduating, I want to believe that I am better equipped for it, that in three years I have matured enough as a writer and a person to undertake a second reading. Ten letters make up this slim volume. The “young poet” they address is Franz Xaver Kappus, who had written to Rilke in 1903 in the hopes of finding an artistic adviser or, at the very least, a confidant. He proved to be much more. In his replies, Rilke examines the complications of human experience as well as burdens peculiar to the artist. One can only imagine Kappus asking him: What does it mean to be an artist? to be human? Rilke begins with an image of the artist as a solitary creature. He characterizes artistic work as an exploration of one’s inner self, a cultivation of the “vast space” surrounding each individual: a lifelong development of poetics. “Everything is gestation and then birthing,” he says, comparing the creative process to sexual union, creation, fruition (the word appeals to the senses). On humanity, he advises openness to life: everything is tied to mystery, and the experiences we are unable to explain must be surrendered to something greater than us. Some reviews back I said that I believed no book is worth reading thrice. Now I am forced to recant that statement. 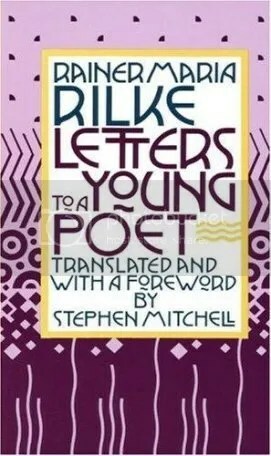 A few years down the line, I would probably be up for a third reading of Rilke’s Letters. Nothing touches a work of art so little as words of criticism: they always result in more or less fortunate misunderstandings. Things aren’t all so tangible and sayable as people would usually have us believe; most experiences are unsayable, they happen in a space that no word has ever entered, and more unsayable than all other things are works of art, those mysterious existence, whose life endures beside our own small, transitory life. No one can advise or help you—no one. There is only one thing you should do. Go into yourself. Find out the reason that commands you to write; see whether it has spread its roots into the very depths of your heart; confess to yourself whether you would have to die if you were forbidden to write. …for ultimately, and precisely in the deepest and most important matters, we are unspeakably alone; and many things must happen, many things must go right, a whole constellation of events must be fulfilled, for one human being to successfully advise or help another. And in fact the artist’s experience lies so unbelievably close to the sexual, to its pain and its pleasure, that the two phenomena are really just different forms of one and the same longing and bliss. Have patience with everything unresolved in your heart and…love the questions themselves… Don’t search for the answers, which could not be given to you now, because you would not be able to live them. And the point is, to live everything. …ask yourself…whether you have really lost God. Isn’t it much truer to say that you have never yet possessed him? …and if you are terrified to feel that even now he does not exist…what justifies you then, if he never existed, in missing him like someone who has passed away and in searching for him as though he were lost? It is also good to love: because love is difficult. For one human being to love another human being: that is perhaps the most difficult task that has been entrusted to us, the ultimate task, the final test and proof, the work for which all other work is merely preparation. The future stands still…but we move in infinite space. How could it not be difficult for us? This entry was posted in Book, Nonfiction and tagged Letters to a Young Poet, Rainer Maria Rilke on December 26, 2010 by Michelle. I like to think that I am rarely at a loss for words, but this time I am. When Damien suggested that I watch this film I downloaded a copy immediately, although I did not know yet what to expect of it. Ace told me that it was lengthy and somewhat dragging (true to its title, she said), and so even as I started playing the movie last night I supposed it would just be a run-of-the-mill production, something to help pass the lethargic hours of the holiday season. I was wrong. Online synopses will tell you that Jean-Pierre Jeunet’s A Very Long Engagement is about a young woman’s (Audrey Tautou) relentless search for her fiancé (Gaspard Ulliel), who might have been killed in World War I. Much of the story occurs during the last years of the war, structured in flashbacks as Mathilde pieces together the history of Bingo Crepuscule, where five soldiers (including her childhood sweetheart Manech) are condemned to death for self-mutilation. In her investigation she traces the fates of all five men, along the way encountering characters like Tina Lombardi (Marion Cotillard), a murderous prostitute seeking vengeance for her lover’s death. I can go on and on describing the plot, but what in mere words I cannot say is how beautiful the cinematography was—the only thing I can tell you is to go watch it yourself. Memorable characters like the charming, polio-ridden Mathilde and the inflexible, sorrowful Tina Lombardi abound in the movie. Admittedly its convoluted plot made it difficult to follow at times (exacerbated by my distressing unfamiliarity with French names), but that is my only complaint. More than the horrors of war the story is a testament to the overwhelming tenacity of love: I for one could not help but surge with hope at almost every bend and turn. I believed in Manech, hoped with Mathilde; perhaps the only thing I failed to do was cry. Although the movie was unable to sufficiently suspend my disbelief, I found myself consciously disregarding it in favor of hope. That fact alone, I think, speaks volumes. Comparisons with Amelie (2001) are unavoidable, since it’s the same director and actress. Like many others I find myself preferring the earlier film, though I’m not entirely sure why. But still I cannot deny very much enjoying A Very Long Engagement; I did not even feel those two hours. The first time Mathilde and Manech made love, he fell asleep, his hand on her breast. Each time his wound throbs, Manech feels Mathilde’s heart in his palm. If Manech were dead, Mathilde would know. In what she would refer to as her ‘Milly expedition’, the sun, the sky, and nature are with her. This entry was posted in Drama, Film, War and tagged A Very Long Engagement, Audrey Tautou, Gaspard Ulliel, Jean-Pierre Jeunet, Marion Cotillard, Un Long Dimanche de Fiançailles on December 24, 2010 by Michelle. During conversation with Maki over beer last night, he conjectured that perhaps this Isagani complex answers for the Philippines’ constant struggle with nationhood: perhaps the Filipino character is too much of a lover (a poet) to birth someone like Simoun. If nothing else I found this is a most interesting reading. Of course it may also be seen as an expedient excuse, but—if it’s at least even partly true—I think it’s not such a bad reason after all. Spanish will never be the common language in the country; the people will never speak it because for the ideas of its mind and the sentiments of its heart there are no words in that idiom. Resignation is not always a virtue. It is a crime when it encourages tyrannies. There are no despots when there are no slaves. What was going on within Isagani’s soul was indescribable: wrath, jealousy, humiliation, resentment, raged inside him. There was a moment when he wished the theater would collapse; he had violent desires to laugh uproariously; to insult his beloved; to provoke his rival; to create a scandal; but he contented himself with sitting quietly and not looking at her at all. Education is disastrous, absolutely disastrous for the Philippines. In the Philippines it is a known fact that patrons are needed in everything, from the time one is baptized until one dies, to obtain justice, secure a passport or exploit whatever industry. Why independence if the slaves of today will be the tyrants of tomorrow? This entry was posted in Book, Novel and tagged El Filibusterismo, Jose Rizal on December 23, 2010 by Michelle. I have a love/hate relationship with this book (borrowed from Maki). I did not begin it with any particular enthusiasm, but it did not take me long to realize that it would provide me no ordinary reading experience. I fell in love within the first hundred pages. Frequently I had to pause in the middle of a page, close the book, and—as a curse passed between my lips—put it down like I needed time to recover. I had mind explosions. (The only other time I ever felt like this was with Nikolai Berdyaev’s The Destiny of Man.) I marveled at the author’s perception and use of rhetoric, the thick fluidity of his language. I drowned in it; I wanted to quote everything. Each break from reading was like surfacing from underwater to breathe. It took me a long time to finish A Lover’s Discourse because I found it too heavy—and too beautiful to waste on a few readings. I could not take it in all at once; I wanted it to last longer. The latter half of the book sobered me up. My awe lessened. I saw the lover as a pathetic creature. Werther (from Goethe’s The Sorrows of Young Werther) expresses the exact sentiments of the lover that Barthes describes. He is forever anxious, a slave to his “Image-repertoire,” and he knows it. Yet he remains “Intractable.” Yet we sympathize. (The novel initiated numerous copycat suicides across 18th century Europe.) Do Goethe and Barthes present an exaggerated idea of the lover? Yes. But isn’t it precisely this exaggeration that characterizes love? Objections may be raised. The more cynical may argue disbelief in the existence of the “Image-repertoire.” To this Barthes answers, somewhat defiantly, confidently: Does it matter that the perfect being does not exist in reality? He exists in your mind, you know as well as I do. I hated this book because it was right. No matter how much I try to deny it, there was (is) something in me that identified with what Barthes describes, and if that is love then perhaps there really is within all of us this “emptiness,” this “looking” for someone to love. “I never fall in love unless I have wanted to”—if anything, this is the problem. When I said I had a love/hate relationship with this book I was lying. I absolutely loved it. 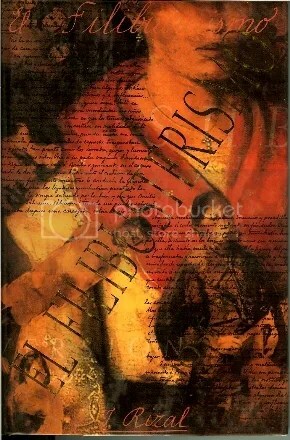 The love story…is the tribute the lover must pay to the world in order to be reconciled with it. I encounter millions of bodies in my life; of these millions, I may desire some hundreds; but of these hundreds, I love only one. This stubbornness is love’s protest: for all the wealth of ‘good reasons’ for loving differently, loving better, loving without being in love, etc., a stubborn voice is raised which lasts a little longer: the voice of the Intractable lover. Someone tells me: this kind of love is not viable. But how can you evaluate viability? Why is the viable a Good Thing? Why is it better to last than to burn? A mandarin fell in love with a courtesan. ‘I shall be yours,’ she told him, ‘when you have spent a hundred nights waiting for me, sitting on a stool, in my garden, beneath my window.’ But on the ninety-ninth night, the mandarin stood up, put his stool under his arm, and went away. You wait for me where I do not want to go: you love me where I do not exist. To know that one does not write for the other, to know that these things I am going to write will never cause me to be loved by the one I love (the other), to know that writing compensates for nothing, sublimates nothing, that it is precisely there where you are not—this is the beginning of writing. What does ‘thinking of you’ mean? It means: forgetting ‘you’…and frequently waking out of that forgetfulness. Out of love, the delirious assumption of Dependence (I have an absolute need of the other), is generated, quite cruelly, the adverse position: no one has any real need of me. So desire still irrigates the Non-will-to-possess by this perilous movement: I love you is in my head, but I imprison it behind my lips. I do not divulge. I say silently to who is no longer or is not yet the other: I keep myself from loving you. 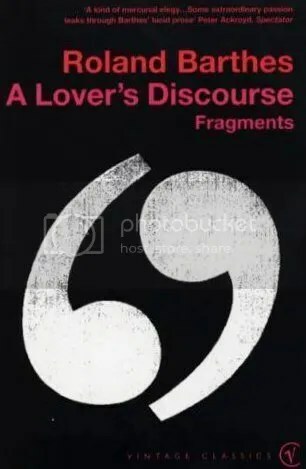 This entry was posted in Book, Philosophy and tagged A Lover's Discourse: Fragments, Roland Barthes on December 17, 2010 by Michelle.